20th Anniversary Pendulum Preview, Plus Prize for new D-1! Thread: 20th Anniversary Pendulum Preview, Plus Prize for new D-1! We have a few images to clarify and add a few new details. The colors of the Pendulum are both from the original 1.0 release, the same as how the 20th V-Pet used the original V-Pet release colors. Based on the image we have, these are completely identical to their original release color wise. Both versions combined will have over 200 Digimon (with some that haven't been seen before in the Pendulums, ala the 20th V-Pet.) 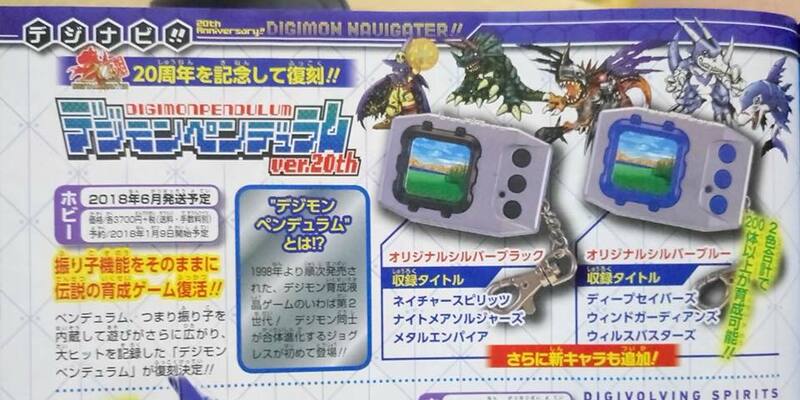 Just like the 20th V-Pet, you'll be able to raise two Digimon at once. The new Digimon will be a Legend-Arms Digimon who turns into a legendary weapon, just like Zubamon. It'll be interesting to see the final lineup, as even if you combine the lineup of the Pendulums, you aren't anywhere near 200 Digimon. The release date is scheduled for June 2018 and each Pendulum is 3,700 yen. Pre-orders are currently scheduled to open on January 9th. Signups for the new D-1 Tournament are open! Signups will close on January 7th. We have an image of the prize already though! 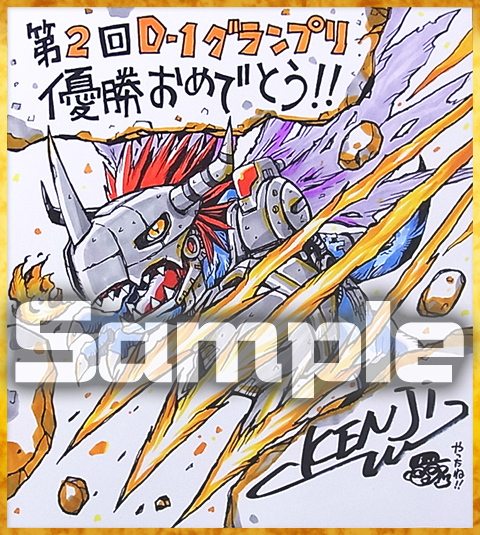 A MetalGreymon shikishi drawn by Kenji Watanabe! Perhaps by the time of the 3rd new generation D-1 the Pendulum's will not only be out, but be including in compatible V-Pets! Update- Replaced the V-Jump with a slightly better quality one. Not sure who the source image is from at the moment though. The prior discussion thread for the Pendulum 20th is here. Update- Added a new image, and additional info from Premium Bandai. This is great news! I'm glad that we finally have the pre-order and release dates for this. 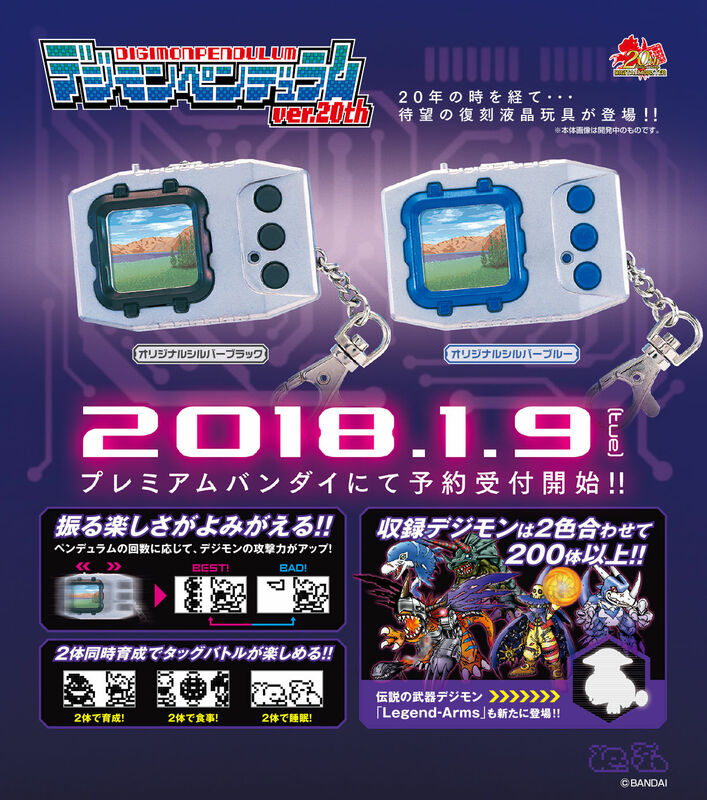 Though I wonder if it's going to let us raise two Digimons at the same time like the V-Pet version 20th or will it be a single Digimon like in the originals? Also that Metal Greymon art looks amazing! 200 line up! Half will be battle only though. I'm going to find it very weird that the Silver and Blue unit, despite being in a Nature Spirits case, will not have the Nature Spirits egg. Indeed. XD It will be very interesting to see what a second wave might look like, too. Also, is it about a 130-mon roster for the original Pendulums? I might have miscounted, but it looked like only 112 to me. Last edited by Gigamon23; 11-20-2017 at 12:23 PM. Nah, I doubt it. If, and this is a big IF, we get both the original 1.X and X.5 line up we will have over 130. As someone mentioned above. Also if, and that's a bigger IF, we get the additional Survive and Revive roster we will already be over 150. Well, there are 20 Digimon in each Pendulum, which would be 120 Digimon. Then the .5 versions of the first five Pendulums include 3 alternate Digimon each, which makes for a total of 135. However, 8 of the Digimon in Virus Busters appear in other Pendulums, so our final total is 127. 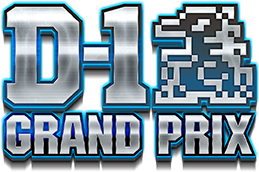 Just a reminder on the D-1 prize that we are at the mercy of Bandai a bit if anyone does win, as the ToS calls out being a resident of Japan as a qualification. I was able to get it last time, but in talking with them they did warn that they may not be able to do that in the future if I were to win again.